The twin issues of access to and quality of healthcare are ones that are all too familiar for many people. In Nigeria, the WHO estimates that there are 0.395 physicians per 1,000 people, with the comparable figure in the UK being 2.74 per 1,000. Aside from a lack of qualified doctors and nurses, however, there are also concerns of the skill levels of some of these medical practitioners. eHealth Nigeria is an organisation working to address the skills shortage of medical staff in Nigeria and we’re delighted to have awarded them a grant of £11,392 to develop and test a mobile learning platform for use by Nigerian medical personnel. The Mobile Learning Platform will provide NGOs and government agencies with a tool to effectively create and implement mobile learning programs. The system can run on regular phones using SMS or on smart-phones using the “eLearning App”. Organizations will be able to use courses designed by eHealth Nigeria as well as to upload and create their own courses. The web-based portal will allow organizations to monitor participant progress throughout the eLearning course. 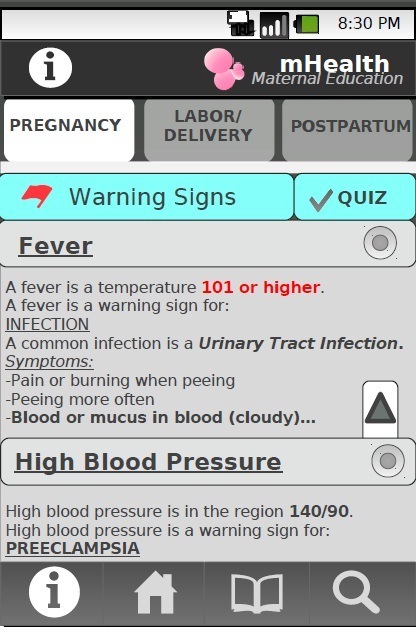 To test the effectiveness of the Mobile Learning Platform, a pilot will be implemented at health facilities in Kano State on maternal and child health. An impact report will be developed stating the effects the Mobile Learning Platform had on health worker knowledge. The differences between the smart-phone and regular-phone interface is the method of course material delivery. Regular-phones will be delivered materials via SMS and can respond to quizzes via SMS. Smart-phone users will have more functionality than regular-phone users. They will be able to use the “eLearning App” that will contain the course materials, pictures, and video tutorials. They will also be able to submit and receive content via GRPS instead of SMS. We often approach smartphone-driven projects with a degree of scepticism, simply because of the availability and very low prevalence of such phones in many of the countries where we work. In this instance, however, the project seeks to work with a narrow and specific sector, some of whom already enjoy access to smartphones. In addition, we recognise that there are limits to what can be achieved via SMS and that in some cases – such as this – smartphone content, e.g. video and pictures, can make for a fuller and more rewarding learning experience. It’s for this reason that we will be particularly keen to learn more of the evaluation that eHealth Nigeria plan to carry out with this project. If successful, however, and smartphone ownership continues to rise, it could well have great potential for scaling and replication.